The University of Edinburgh is a strong supporter of open access (OA), and in 2018, researchers at Edinburgh published over 7,000 peer reviewed research outputs, of which over 5,181 (74%) are openly available from the University’s research portal (www.research.ed.ac.uk). As a large and diverse organisation there is naturally a large variation in the way in which we make our research openly available. From our total of 5,181 open access research outputs we find that 2,959 outputs (or 57%) are published as Gold OA – where the publisher makes the version-of-record open sometimes for a fee – and 2,222 (or 43%) are available as Green OA – where the author makes their accepted manuscript open from our Institutional or Subject Repositories for free. Over the last 5 years the University has spent in the region of £5 million with publishers to make around 2,800 papers Gold OA. The majority of these papers were published as ‘hybrid OA’ in subscription journals where the publisher charges subscription fees to access the closed content, and also charges an open access fee to make individual papers open access. This practice of charging twice is called ‘double-dipping’ as large research intensive institutions have not seen their subscription costs lowered in proportion to their open access expenditure. 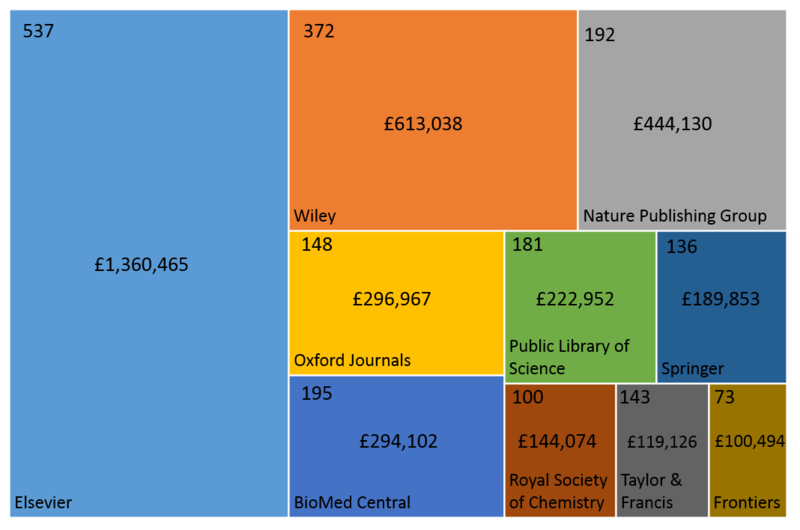 Block chart showing the top 10 publishers who received funds from the RCUK open access block grant during 2013-2018. The number in the top left of each box is the total number of Gold OA papers published, the number in the middle of the box is the total expenditure and the name of the publisher is in the bottom left of the box. Research funders like UKRI and the Wellcome Trust previously supported this ‘hybrid-OA’ model, but they no longer believe that it supports a transition to full OA which is their aim. To precipitate a change in the publisher’s behaviour and to increase the adoption of open access, a number of important European research funders, co-ordinated by Science Europe, developed Plan S.
Plan S requires that, from 2020, scientific publications that result from research funded by public money must be published in compliant Open Access journals, and specifically states that ‘hybrid OA’ journals won’t be supported. As it currently stands, Plan S will be hugely disruptive as researchers will potentially not be able to publish in their journal of choice. In order to understand the impact of how Plan S will affect our research staff, departments and the broader academic community, Library & University Collections carried out a wide ranging consultation exercise. The Scholarly Communications Team held a series of eight open meetings, during the period 23rd – 30th January 2019, which were attended by over 260 staff. As far as we are aware this was the largest consultation held by a HE institution. UKRI will decide how to apply the principles of Plan S once it has concluded an ongoing review of its own open-access policies, which is not likely to be completed until next autumn. The current Open Access policy is firmly in place until 31st March 2020 and it would be improbable for UKRI to change terms and conditions of grant awards midway through the year. We can therefore expect UKRI to adopt Plan S from 1 April 2020. One of my favourite initiatives in the humanities is the Open Library of Humanities. It is funded through a model of library partnership subsidies which collectively funds the platform and its array of journals. A large number of libraries and institutions worldwide already support the OLH, which makes for a sustainable, safe platform. Edinburgh University Library supports the publication of academic and student-led open access journals by providing a journal hosting service using the Open Journal Systems software. The Open Journal service is available to University of Edinburgh students and academics and is provided free of charge. Provide the service free of charge on the condition that journals requirements can be met without additional cost or time to the Library. On publication, apply to DOAJ (Directory of Open Access Journals). Currently there are 16 journals on the platform and we are looking to grow the service over the new two years. Yesterday’s blog post suggested that our reliance on Hybrid Gold Open Access to meet research funder’s open access requirements was too expensive and libraries should be supporting alternative pathways. In terms of pure numbers the main way the University of Edinburgh is making access to it’s research open is via Green Open Access (OA) – where the Author’s Accepted Manuscript (AAM) version of the research output is deposited in a repository and made available as soon as publishers copyright policies allow. Since we started compiling monthly reports in 1st April 2016 we have made 6266 journal articles and conference proceedings open access which equates to around 92% of the University’s total output. 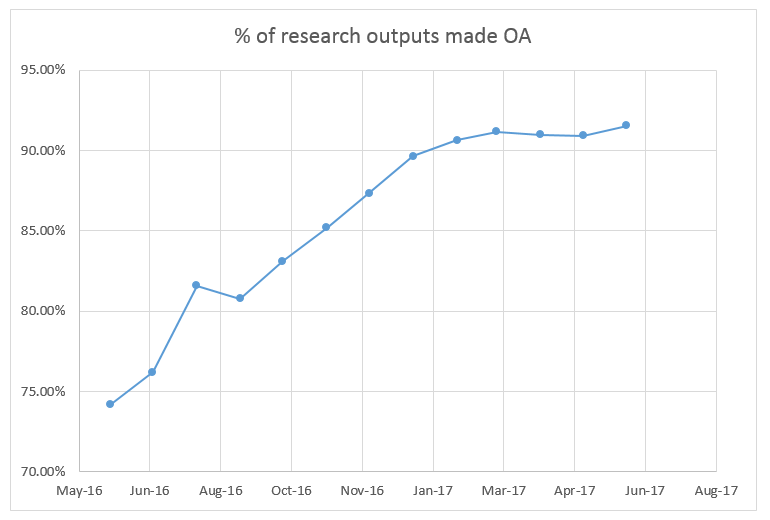 The results of the open access implementation plan have been extremely successful and we can report a 92% adoption rate for Green OA. The Scholarly Communications Team prepares monthly reports using data from our repository to identify the current level of compliance with the REF open access policy. These monthly reports indicate the numbers of in-scope research outputs (journal articles and conference proceedings with ISSNs) and whether they meet the requirements for the next REF, as per our repository’s compliance-checker functionality. The figure and table below show the growth in the percentage of research outputs made open access since April 2016 and also a more detailed breakdown by subject area. The reporting period is a rolling window three months behind the current date. Not immediate. Most publishers (but not all) require an embargo period of between 12-36 months before the AAM can be made open access. Not only are long embargo periods are hugely detrimental for scholarly communication, but I believe they are unnecessary. Many academic publishers insist on long embargo periods to protect journal subscription revenue from cancellations. However, a number of academic publishers (including the Royal Society, Cambridge University Press, Emerald and SAGE) have zero month embargoes for selected titles are they are not unduly affected by cancellations. Not compliant with all research funders policies. Unfortunately, these long embargo periods are not compliant with all research funders policies (e.g. RCUK) which means that many researchers are forced to pay Hybrid OA fees for their publications. As we discussed yesterday Hybrid OA accounts for 70% of our open access expenditure. In the UK researchers are faced by a myriad of different funders policies (e.g. HEFCE, RCUK, Horizon 2020) which currently require different routes to open access. Not cost-free. If you factor in hidden costs – such a repository platform fees and staff costs for mediated deposits/copyright checking – Green OA is more expensive than you would initially imagine. Whilst gathering data for a recent HEFCE open access questionnaire we estimated that we have around eleven full time equivalent staff distributed across the entire University working on open access implementation. If you aggregate all these costs then the cost per paper to deliver Green OA is somewhere in the region of £45 which I think is too expensive (but put in context this is still pretty good value for money as our average Gold OA costs are £1,676 per paper). In summary, Green OA is a step in the right direction but still does not answer all of the problems that we currently face. What we can do to alleviate the issues of long embargo periods, harmonising research funders policies and simplifying processes and thereby lowering costs is the topic of tomorrows blog post – the UK Scholarly Communications Licence. The University of Edinburgh receives two main block grants from Research Councils UK (RCUK) and Charity Open Access Fund (COAF) to support researchers funded by them to comply with their open access policies. The Library’s Scholarly Communications Team manages these block grants on behalf of the institution. In 2016/17 we spent £1,167,966 to make 697 articles open access via the Gold open access route. In addition, £28,951 was spent on other publication costs, for example page and colour charges. Our overall spend on open access in 2016/17 was £1,167,966 which bought 697 papers, with an average Article Processing Charge (APC) of £1,676. The open access expenditure is dominated by three large publishers: Elsevier, SpringerNature and Wiley. These 3 publishers account for 53% of our total spend. Note that we have shown SpringerNature as three individual publishers in the table and figure as they have distinct publishing identities – Springer, Nature and BioMedCentral. The top individual publisher (Elsevier) alone accounted for 24% of the total spend, with their APCs 56% more expensive than the average. Generally speaking, we found the highest individual APCs were from US society publishers, like the American Heart Association or American Chemical Society. Best value APCs were from publishers where we have offsetting or national agreements with – for example Taylor & Francis, Springer and Royal Society of Chemistry. 70% of our expenditure is on Hybrid Gold OA – where journals charge a subscription and APCs – rather than pure Gold OA (30%) where APCs are the only charge. Looking at the whole dataset Hybrid Gold OA is more expensive (£2,075) than pure Gold OA APCs. (£1,581). The University of Edinburgh publishes 6 -7,000 journal articles and conference proceedings per year. In the current market conditions if we were to fully transition to Gold OA then we estimate it would cost in the region of £10M per year. To put this in context Edinburgh University Library spends approximately £4M per year on e-journal subscriptions so this represents a significant uplift on the total cost of publication. I suspect this figure is similar for other research-intensive universities. At its current scale and intensity, open access as purely delivered by Hybrid Gold OA and Gold OA alone is not likely to happen. Any increase to the total cost of publication is not acceptable. If we wish to transition to full open access then significant cost mitigation for paid open access needs to occur, and alternative low cost or no cost options need to be investigated and adopted. Some options are described below. Push for offsetting deals : Libraries should be a) requesting offsetting deals, b) pushing for significant discounts, and c) helping publishers adopt transformative business models. Examples of publishers offering good offsetting schemes are IOP – where an actual rebate is given depending on Gold OA spend – and SAGE Publishing who globally discount the subscription rate of journals where more than 5% of articles are published as Gold OA. SAGE also offer steep open access discounts of 80% for some members of consortia subscriptions. Taylor & Francis are another publisher which significantly reduce APC cost (by 75%) to consortia members. These steep discounts are welcome, but have a fundamental problem in that they rely on privilege. Discounts are not available to all authors as they rely on institutions having a subscription. Transformative business models such as the UK Springer Compact national agreement, or the Royal Society of Chemistry Read and Publish agreement, are also welcome as they lower transactional barriers for authors to participate in Gold OA. This leads to a greater coverage of open access articles in journal titles, rather than the patchy open access that Hybrid Gold OA delivers. The overall costs are also appreciably lower than the cumulative costs seen with Hybrid Gold OA – look at the difference in our expenditure between Elsevier and Springer for a similar amount of Gold OA articles published. Support ‘low cost and no cost’ Gold OA : Academic and National Libraries should support open access initiatives that are inclusive and open to scholars who do not have budgets for publishing. Gold OA does not necessarily equate to paid open access. Many academic or library-led publishing initiatives do not charge Article Processing Charges as the costs are covered through alternative mechanisms. Some examples of innovative academic or library-led publishing activities are described below. 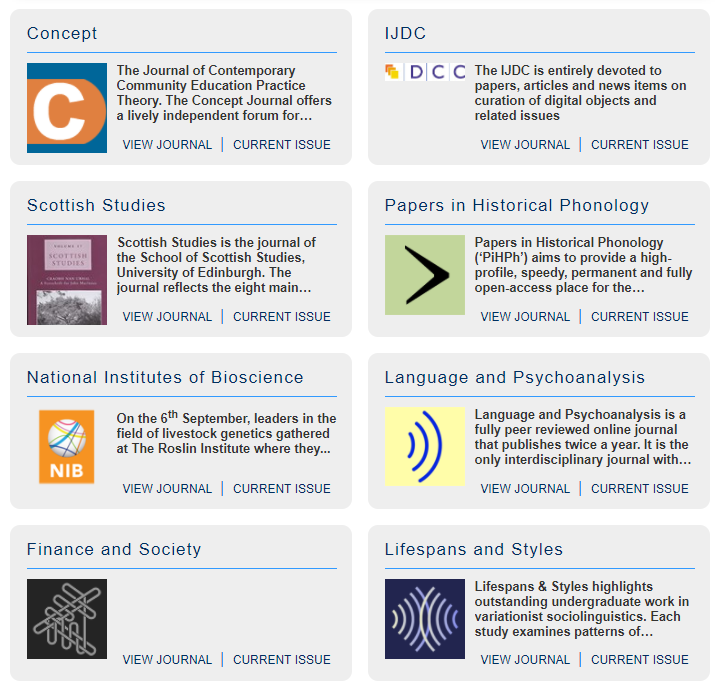 Edinburgh University Library provides an Open Journal Service which is available free of charge to University of Edinburgh students and academics. It provides a hosting platform for academic and student-led groups to create and publish their own Open Access journal. Currently the service has a portfolio of 16 journals and is looking to grow and develop in the coming year. The Open Library of Humanities (OLH) is a charitable organisation dedicated to publishing open access scholarship with no author-facing article processing charges. The OLH publishing platform supports academic journals from across the humanities disciplines, as well as hosting its own multidisciplinary journal. The University of Edinburgh has opted to support the Open Library of Humanities at a higher rate than required. This additional support will enable the OLH to continue its growth mission to convert subscription journals to a solid, ongoing, open-access model, with no author-facing charges. Reduce reliance on Hybrid Gold OA : Hybrid Gold OA – where journals charge both subscriptions and Article Processing Charges – is too expensive. Unfortunately, Hybrid Gold OA which accounts for 70% of our expenditure are significantly more expensive than pure Gold OA costs. It is not uncommon to receive invoices of $5,000 for individual APCs. Our open access block grants are supported either directly by taxpayers money (RCUK), or from charitable organisations (COAF), so it is imperative that anyone managing these funds should be seeking best value for money. I would find it very difficult to explain to someone who has raised money for Cancer Research UK the hard way by running the London Marathon that their sponsorship money has only paid for half an APC. Where research funders policies allow we should be seeking to reduce our reliance on Hybrid Gold OA by utilising alternative mechanisms like Green OA, which we will visit in more detail in tomorrow’s blog post. We are delighted to announce the deposit of the 20,000th item into our institutional repository the Edinburgh Research Archive (ERA). ERA is a digital repository of original research which contains documents written by academic authors based at, or affiliated with, the University of Edinburgh that have sufficient quality to be collected and preserved by the Library, but which are not controlled by commercial publishers. Holdings include full-text digital doctoral theses, masters dissertations, project reports, briefing papers and out-of-print materials. 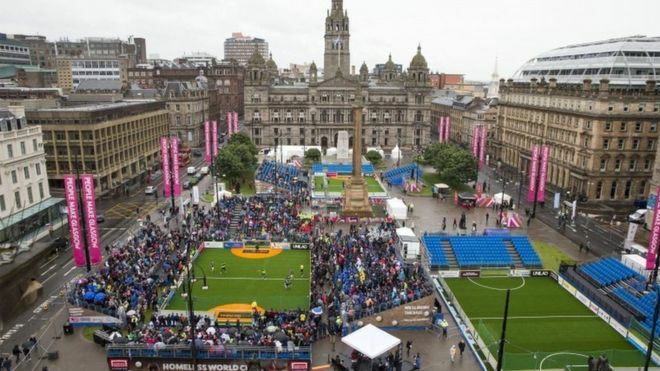 This work investigates the relationship between sport, homelessness and poverty, and considers the way two social enterprises – the Homeless World Cup and Street Soccer (Scotland) – help overcome homelessness and its associated effects. We estimate that these costs could account for up to 20% extra in the total cost of publication that is not currently being accounted for. This additional cost is important to take into account when institutions are negotiating fair offsetting agreements for open access publishing. We would welcome any constructive criticism on the work so please have a read and leave an open review so that we can improve the article. Copyright waffle and the illusion of choice. An academic colleague of mine recently had an article accepted for publication in a journal. As usual they were emailed by the publisher who asked them to sign an Author Publishing Agreement which would transfer copyright to them. However, the author noticed that the publisher also allowed authors to retain their own copyright by instead signing a Licence to Publish. The researcher wasn’t sure whether to assign copyright to the publisher, or if it would be preferable for them to retain copyright. On the face of it, it seems like a no-brainer – keep your copyright rather than signing it away. This is the mantra that open access advocates have been saying for years. Always read the small print – or get someone else to do it for you – and understand what you are getting yourself into. In this particular case, if you read both the standard Publishing Agreement (to transfer copyright) and the Licence Agreement (to keep copyright) with a fine-tooth comb you will find that they pretty much contain the same language verbatim. There is no practical difference between them both in the end results. Both the author and the publisher will end up with exactly the same rights for exactly the same duration. There is the illusion of choice but it literally doesn’t matter which piece of paper is signed. 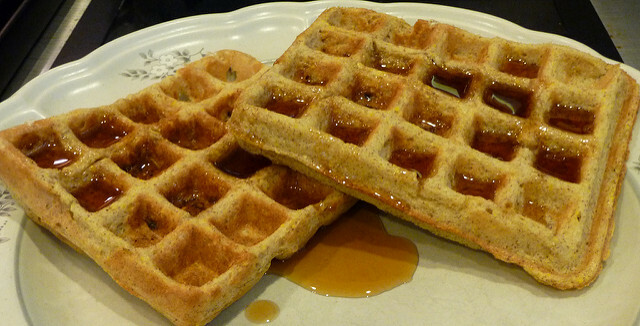 This is an example of Copyright Waffle and it sidetracks from the important things. By hook, or by crook, make your work open access. If you don’t know how, then ask someone who does; generally speaking Librarians will always be able to help you. 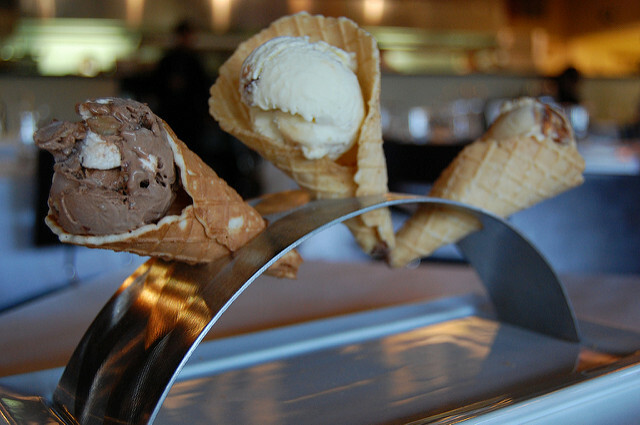 If you have the option, publish your work with a Creative Commons licence; CC-BY is our favourite flavour. My name is Anna Krzak, and I am an Open Access Research Publications Administrator for the College of Medicine and Veterinary Medicine at the University of Edinburgh. I have been in this role since March this year. Previously, I worked as an Open Access Publications Assistant (also for MVM) so I am not entirely new to the University and its Open Access (OA) project. I have been assisting academics within the College of Medicine and Veterinary Medicine with the RCUK OA policy implementation since April last year but, since I used to work mostly from home, I should introduce myself properly now. The main purpose of my new role is to gather Open Access full text versions of research papers and the accepted peer-reviewed manuscripts and to upload the files to the Institutional Repository. As part of that, I ensure that the licensing terms and conditions are adhered to, including any embargo periods, and that any licenses or set phrases are acknowledged in PURE. In addition, I often advise academic staff on research funders’ Open Access policies and relevant Open Access options. If necessary, I consult the publishers in regard to their often unclear self-archiving policies (this is probably my least favourite bit..). As such, my role combines both theoretical and practical aspects of the OA implementation project that’s currently being undertaken throughout the University. Please note that the collected evidence refers only to peer-reviewed research articles (including review articles) and conference proceedings that were submitted for publication after 1 April 2013 and that acknowledge the RCUK funding (as per the RCUK OA policy). Approximately 224 research outputs have been identified, of which 192 have open access documents available to the general public. This means an 85% open access compliance rate (as of 4th June 2014). If we take these points into consideration, the compliance rate for the specified period stands at approximately 67%, as compared to the required 45%. Overall, it’s quite a good result for MVM. This week I’ve been compiling some data for the next meeting of the RLUK Ethical and Effective Publishing Working Group. Some of the data itself is pretty interesting so I thought I would write a quick blog post and share some preliminary thoughts on what it means. The table below shows the top 5 publishers in terms of money spent on article processing charges (APCs) from the RCUK open access block grant in 2013-14. Article processing charges (APC) for the most popular journals for Edinburgh authors. We found that 2 publishers stood head and shoulders clear from the rest of the field. In terms of gross spend and number of articles published the top publisher was Elsevier, with £52.6k and 36 articles. 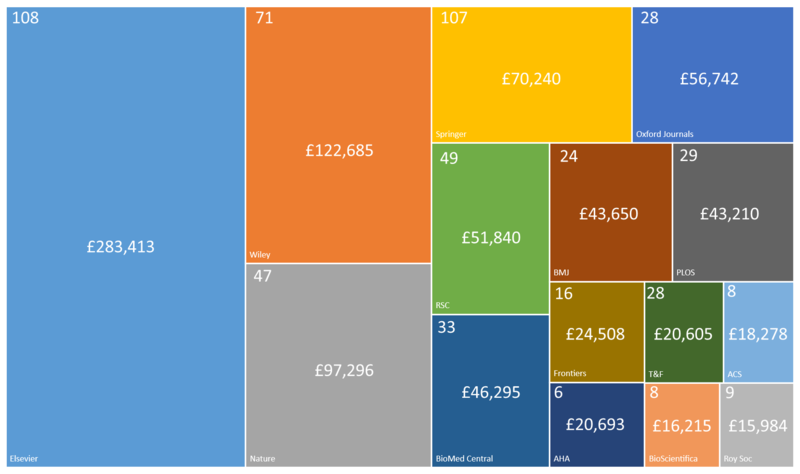 In second place, with a similar publisher profile was Wiley with £51.8k and 35 articles. Both of these publishers were followed by PLOS, NPG and BMC who all had broadly similar spends of around £20k. Whilst the total cost per publisher is interesting, what is really noteworthy is the number of articles that money pays for, revealing something of the publisher’s strategy in the open access market place. The lowest APCs are incurred from the open access journals – PLOS and BMC – who have fees roughly a third less than the other publishers. The highest APCs are incurred by hybrid journals, who also make money from subscriptions, and article reprints. NPG stand out from the crowd as they charge nearly double compared to their competitors. Money Makers – traditional publishers with the biggest market share, the highest number of articles published, APC set to the highest they think market can bear without losing submissions, initially offering biggest discounts for institutional deals to get sign ups (and easier access to authors). Prestige reputation – traditional publishers trading on their reputational status. Significantly less articles published but with larger APCs levied to publish in the journals with the highest impact factors. Strategy of selling high end products and services to those that can afford them. Emerging challengers – new business model and products, more reasonable APCs to attract a market share. However, it is worth noting that since being bought out by Springer, BMC have attracted criticism for raising APCs much quicker than the rate of inflation. When we get round to submitting the final RCUK report we’ll release our full dataset of article processing charges. Disciplines without dedicated subject repositories seem to provide the most popular items downloaded from our institutional service. Whilst looking at the top 99 most downloaded items from the Edinburgh Research Explorer it struck me that the most popular cluster of subject disciplines were those from the Humanities & Social Sciences. 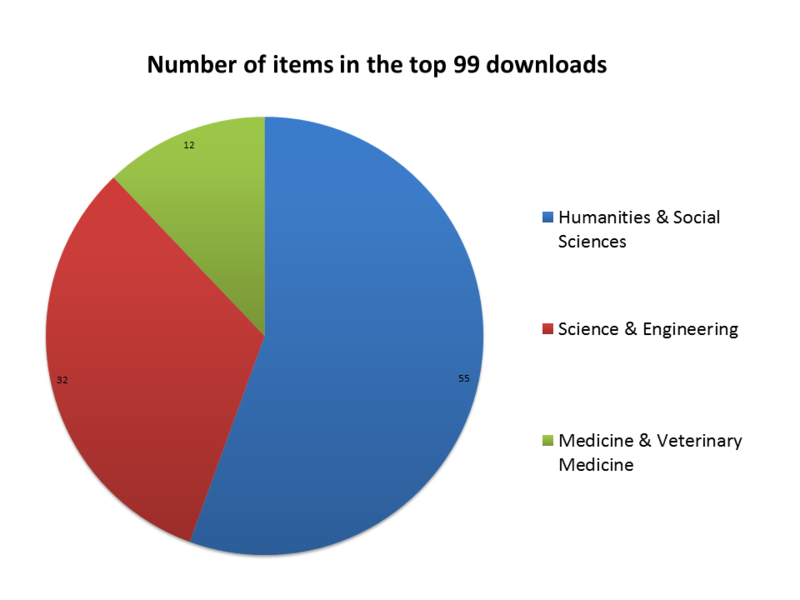 The pie chart above shows the general breakdown by college with the Humanities and Social Science disciplines making up over half of the most popular items downloaded from our institutional repository. Science and Engineering disciplines own a third of the most popular items, whilst Medicine & Veterinary Medicine make up the remainder. I was initially surprised given that the bulk of our 18,000+ open access full text items are from the Science, Technology, Engineering & Technology (STEM) fields. When you further sub-divide the broad classification into finer subject groupings you start to see the beginnings of a pattern emerge. 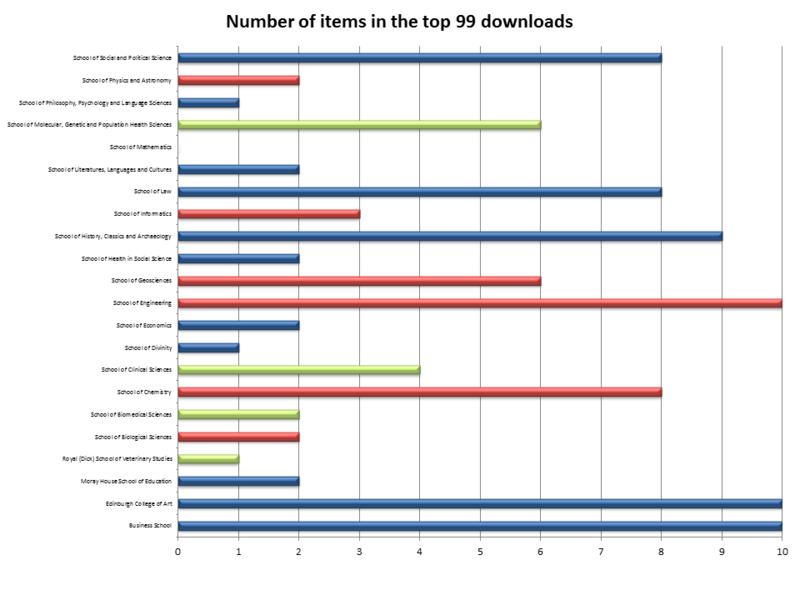 The bar chart above shows the number of items in the top 99 downloads for each school at the University of Edinburgh (apologies for the tiny text – click image to enlarge). Each school broadly maps to a subject area, albeit with some fuzziness; for example, the Edinburgh College of Art comprises a number of creative disciplines like Fine Art, Music and Design brought together in one unit. From our download figures the most popular S&E subject disciplines – Geosciences, Engineering and Chemistry – all don’t have dedicated subject repositories. Whereas, the least popular – Maths, Physics, Informatics and Biological Sciences – are all well covered by the subject repositories arXiv or PubMed Central. The most downloaded HSS units are the Edinburgh College of Art, the Business School, History, Classics & Archaeology and Social & Political Science; none of which have established methods of sharing via subject repositories. Economics is already serviced well by RePeC, Psychology & Language Sciences have CogPrints, and Health in Social Sciences is covered by PubMed Central. Only Divinity and Education don’t have subject repositories and have relatively low download rates. This college grouping is extremely well covered by the PubMed Central subject repository which may explain the poorer than expected usage performance. There are no bad results here: all of the open access downloads from our service are complimentary to those obtained directly from publishers websites and from other subject repositories. These downloads can in a way be considered extra views that we help facilitate. This blog post is only a quick observation and not a fully fledged study so take what I say here with a pinch of salt. Using the number of popular items as a proxy for download rates may not be completely accurate, but on the other hand it does help even out some anomalies (like high download figures for one item skewing the whole data set). To be more comprehensive we should really look at the whole set of 18,000+ items rather than just the top 99. Even with these limitations in mind I still think this is a useful and interesting observation.